Take to the sea. There's nothing better than having the wind in your hair and a wide horizon of blue abeam your sea vessel. In Costa Rica the ocean calls to you. So spend an afternoon chasing sunbeams over crystal waters. Would you like to hook a sailfish, catch and release a marlin, fight a giant tuna, reel in dolphin fish, or catch a few snappers to take back for your dinner? 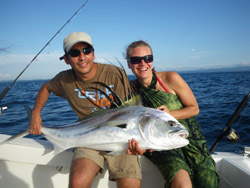 The Pacific Coast of Costa Rica offers excellent opportunities for sport fishing. More than 40 world records have been registered within an 80-mile radius of the Nicoya Peninsula. Billfish are the favored target of most visiting anglers, including sailfish, black marlin, blue marlin, striped marlin (sails and marlin are catch and release only). Inshore species include roosterfish and snapper. Be fair, take ONLY your share. With increased pressure on marine life and the mounting need to conserve ocean resources, over-fishing is a serious concern. Costa Rican fishermen are working hard to manage their fisheries—their livelihoods depend on it—so please respect the laws and limits. There are many charter boats on the west coast of Costa Rica. They can accommodate an individual, a couple, family or group of any size. Rather just observe the marine life? There are many boat tours in Costa Rica that deliver delightful opportunities to see incredible sea life, including dolphins and endangered sea turtles. Whale-watching excursions depart Drakes Bay on the Osa Peninsula to observe Humpback whales from either the northern or southern hemisphere, depending on the time of year. You may also want to visit a sea turtle program. These conservation programs help monitor populations of nesting females along the coasts. It's a great way to see turtles up close and help protect their babies. Or go snorkeling to explore the underwater realm of colorful fish and corals. Ocean adventures abound in Costa.